An outcrop from the 1798 Price-Struthers Map of North Carolina. One little note on an obscure map published in 1798 drew attention to the forks of the Eno River. 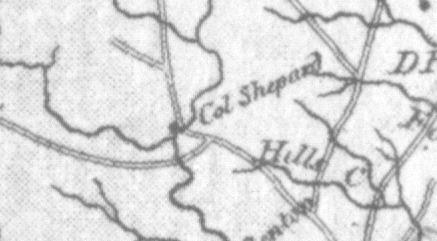 There a mapmaker noted the presence of one "Col Shepherd." This, naturally enough, resulted in our saying, "Who he?" To have one's place located on a state-wide map in that era indicates you were a person of note, or the place was somehow a landmark. Yet, if you visit the spot indicated on the map today there is no sign of prior occupancy. In fact, the land north of the forks of the Eno is a deeply silted flood plain, subject to regular inundations. So, this raises questions about map accuracy and may suggest changes to the land subsequent to map publication. 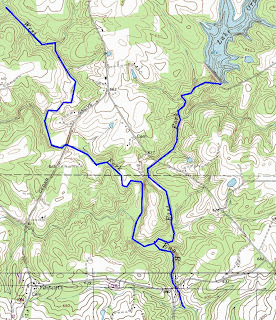 A modern topo showing the forks of the Eno indicates the Price-Struthers map was probably a poor rendering of the upper Eno, but a pretty fair rendering of the roads near the upper Eno. 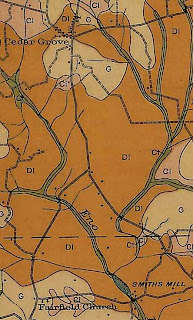 Compare the road layouts of the three roads shown in the topo with the roads shown on the older map. The road running from roughly southeast to northwest, crossing the East Fork was the Hillsborough-Cedar Grove road in the 19th and early 20th century, and the road running east and west has been called "Halls Mill Road" on all road maps of Orange County. 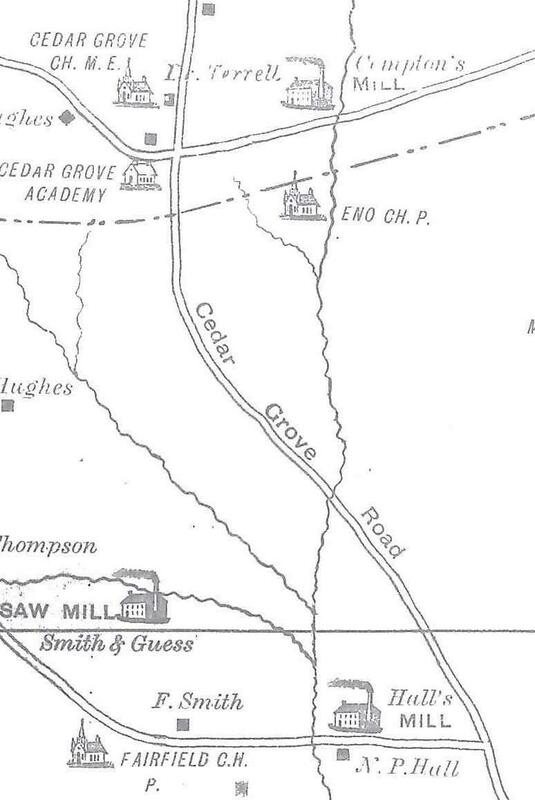 The road running from south to north, crossing the West Fork is now Efland-Cedar Grove Road, but for Price-Struthers it was a variant of what we now call High Rock Road. Given that Price-Struthers depicted the forks incorrectly, they probably drew a landmark reported by a correspondent. The correspondent probably said something like, 'Col Shepard has his home west of the Hillsborough-Saura Town road, in the forks of the Eno.' Being unaware of the actual structure of the land and river, the map maker didn't represent the pronounced neck between the forks. Just below "Col Shepherd", the trivial fork still exists. As a side note, the triangle of land enclosed by the roads and the river west of that intersection was once owned by Senator Thomas Hart Benton's father, and it is likely the birthplace of that remarkable politician. It is conceivable that land at the forks looked considerably different in 1798 than it does now. The course of the river, dictated by bedrock, probably hasn't changed much, but an old dam downstream from the forks had submerged the forks under water for many years. This probably produced the deep silt field seen there today. As is demonstrated by the Tate map, simply drawing schematic river channels continued long after Price-Struthers. Even as late as 1891 the western road forking off Cedar Grove Road appears to be a variation on what is now called High Rock Road. Which is to say, Halls Mill Road, in 1891, continued westward after passing Fairfield Church. The Tate Map, even though it was made at a time when maps were increasingly precise, is known to be riddled with bad renderings of rivers and roads. This certainly seems to be one of those cases. 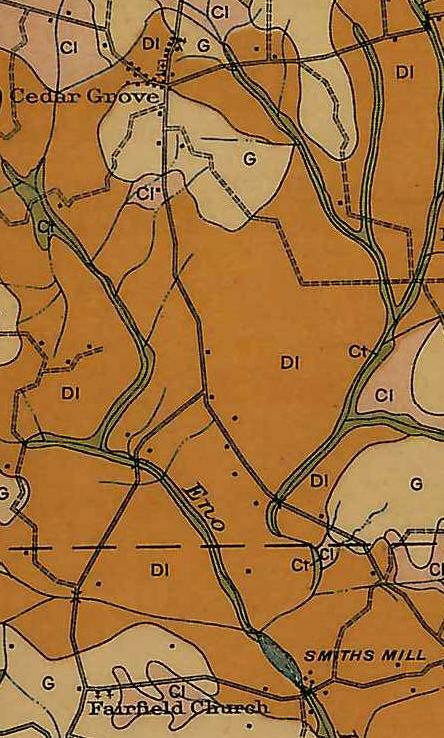 A more recent and more precise rendering of Orange County is the soil survey map (1918). Besides a change of ownership of the mill (Smith's Mill versus Hall's Mill), the soil survey reveals the extent of the mill pond for that mill. From the dam site (roughly 200 feet upstream from the bridge) to the forks is about 2000 feet. And according to the Soil Survey, the pond pushed well past the forks. Today, at the forks, the river cuts through a six foot deep silt bed, and it is quite likely that to find 18th century soils and artifacts, one would have to excavate most of that silt. Clearly, the modern road alignment persists from at least this time period. 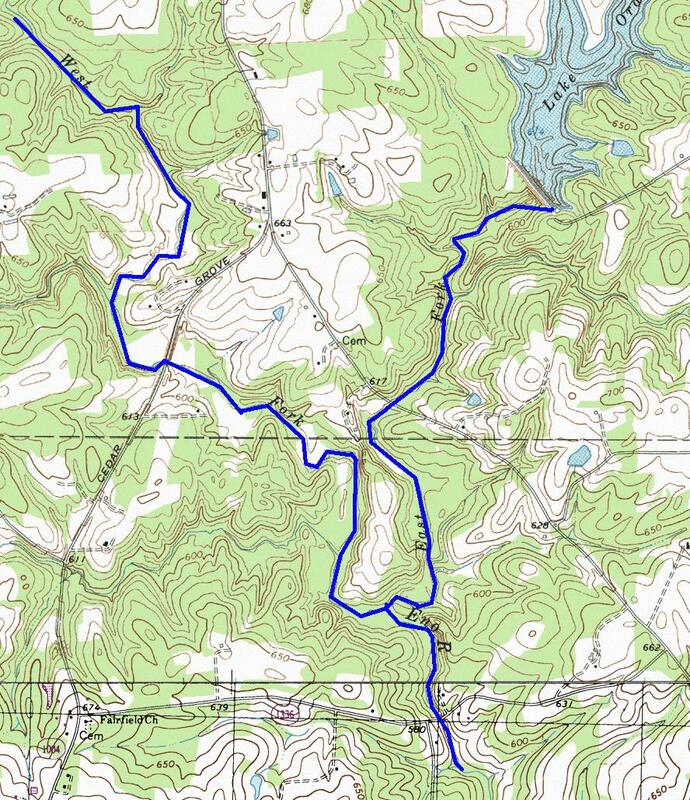 It might be informative to learn when Halls Mill Road ceased to be a variation on High Rock Road, the road to Saura Town, and became, instead, an alternate route to Efland and Cedar Grove. 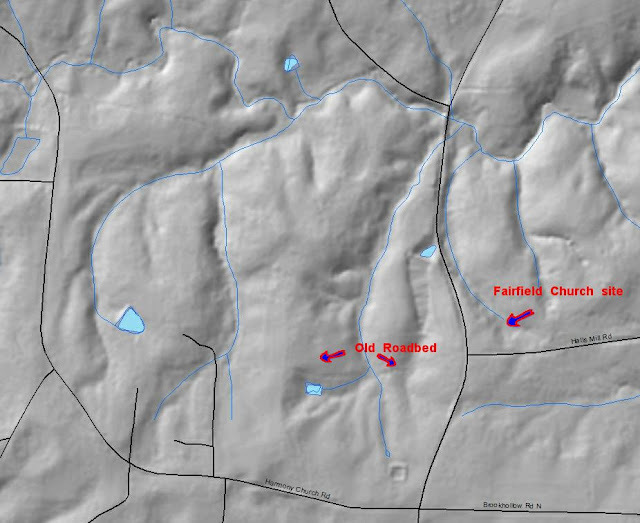 Absent maps (and there really aren't many pre-modern, county level maps for Orange County) somebody would probably have to check Orange County road records (road management was a county court function until shortly after the Soil Survey map was made) or, alternatively, check the land plats for certain critical lots along Efland-Cedar Grove Road and (old) Halls Mill Road. A 1938 county road map does not name the mill but shows the mill building and the pond. It, even more clearly than the Soil Survey, shows the pond backing up well past the forks such that the two forks emerge from under the pond. 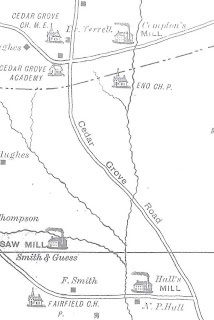 As in 1918, Halls Mill Road tees into Efland Cedar Grove Road. It is worth noting that, in pre-modern times, roads seldom, if ever made tee intersections; it would have seemed a ridiculously inefficient way of making a trivial fork. So, as a rule, when an old road does this you can assume it once continued beyond the intersection. It is very likely that were we to cross to the west side of Efland-Cedar Grove road where Halls Mill Road runs into it, we will find old westward running roadbed. This we can say with confidence because the road bed depression makes a distinct impression on a LiDAR map (see below). By the way, LiDAR almost makes running around in the woods and being cosy with chiggers obsolete. Whether or not the old roadbed continuing to the east the line of an earlier version of Mount Harmony Church Rd once was the variant High Rock Road to Saura Town, we cannot say, but it might be fun to take a look at the vestige to see if it is, indeed, an old road. If it is, there may be sufficient remnants of days gone by with which to date its use. In running on about the roads we've digressed from trying to find "Col Shepherd". Thus far, we haven't even figured out his first name. Land at the forks was once owned by a William Shepherd, and there was a Captain William Shepherd who served with one or another NC regiment in the Revolution, but that is a very weak connection (maybe folks were already using the honorific "Colonel" for any distinguished survivor of a war). So much work remains to be done. Fortunately, the land at the forks of the Eno, from the forks most of the way to the Efland-Cedar Grove Road bridge over the West Fork, is now owned by the Eno River Association. With luck, that means it will remain undisturbed for some time. If for no other reason than to confirm the presence or absence of an appropriately dated occupancy site in the forks, we would spend some precious time stumbling around on the ridge twixt the forks. If we get permission and get some time, we'll let you know what we find.